AWS Config Rules enables you to implement security policies as code for your organization and evaluate configuration changes to AWS resources against these policies. You can use Config rules to audit your use of AWS resources for compliance with external compliance frameworks such as CIS AWS Foundations Benchmark and with your internal security policies related to the US Health Insurance Portability and Accountability Act (HIPAA), the Federal Risk and Authorization Management Program (FedRAMP), and other regimes. Create a Lambda function containing the logic to determine if a resource is compliant or noncompliant. Create a custom Config rule that uses the Lambda function created in Step 1 as the source. Create a Lambda function that polls Config to detect noncompliant resources on a daily basis and send notifications via Amazon SNS. You must set up Config before you start creating custom rules. Follow the steps on Set Up AWS Config Using the Console or Set Up AWS Config Using the AWS CLI to enable Config and send the configuration changes to Amazon S3 for storage. The first step is to create a Lambda function that contains the logic to determine if the Amazon VPC has VPC Flow Logs enabled (in other words, it is compliant or noncompliant with requirement 4.3 of the CIS AWS Foundation Benchmark). First, let’s take a look at the components that make up a custom rule, which I will call the blueprint. The lambda_handler function is the function that is executed when the Lambda function invokes my function. I create the necessary SDK clients and set up some initial variables for the rule to use. The evaluate_compliance function contains my custom rule logic. This is the function that I will tailor later in the post to create the custom rule to detect whether the Amazon VPC has VPC Flow Logs enabled. The result (compliant or noncompliant) is assigned to the compliance_value. The Config API’s put_evaluations function is called to deliver an evaluation result to Config. You can then view the result of the evaluation in the Config console (more about that later in this post). The annotation parameter is used to provide supplementary information about how the custom evaluation determined the compliance. Create an AWS Identity and Access Management (IAM) role that allows the Lambda function to perform the custom rule logic and publish the result to Config. The Lambda function will assume this role. Specify the resource type of the configuration item as EC2 VPC. 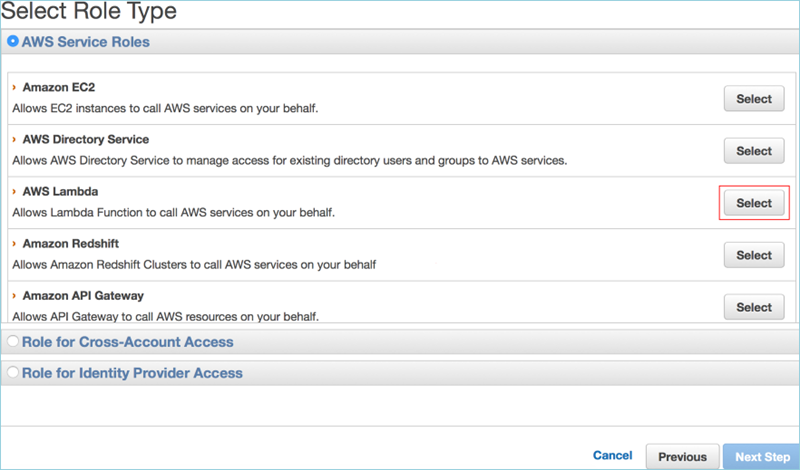 This ensures that the rule is triggered when there is a change to any Amazon VPC resources. 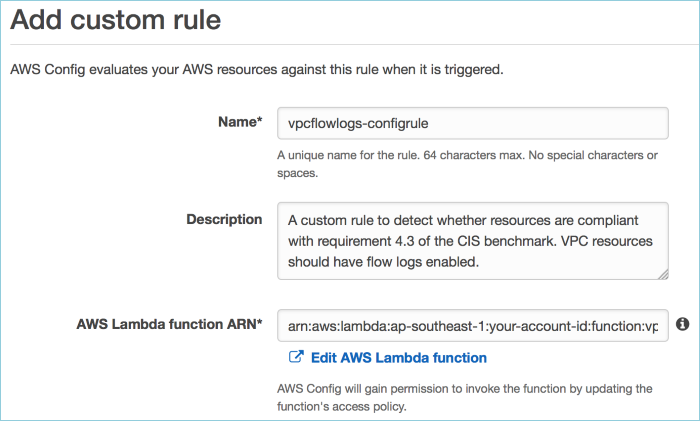 Add custom rule logic to the Lambda function to determine whether VPC Flow Logs are enabled for a given VPC. To create the IAM role, I go to the IAM console, choose Roles in the navigation pane, click Create New Role, and follow the wizard. In Step 2, I select the service role AWS Lambda, as shown in the following screenshot. Finally, I name the new IAM role vpcflowlogs-role. This allows the Lambda function to call APIs such as EC2 describe flow logs to obtain the result for my compliance check. I assign this role to the Lambda function in the next step. To create the Lambda function that contains logic for my custom rule, I go to the Lambda console, click Create a Lambda Function, and then choose Blank Function. For the Lambda function code, I use the blueprint code shown earlier in this post and add the additional logic to determine whether VPC Flow Logs is enabled (specifically within the evaluate_compliance and is_flow_logs_enabled functions). Below the Lambda function code, I configure the handler and role. As shown in the following screenshot, I select the IAM role I just created (vpcflowlogs-role) and create my Lambda function. The last step is to create a custom Config rule and use the Lambda function as the source. To do this, I go to the Config console, choose Add Rule, and choose Add Custom Rule. I give the rule a name, vpcflowlogs-configrule, and description, and I paste the Lambda ARN from the previous section. I click Save to create the rule, and it is now live. Any VPC resources that are created or modified will now be checked against my VPC Flow Logs rule for compliance with the CIS Benchmark requirement. From the Config console, I can now see if any resources do not comply with the control requirement, as shown in the following screenshot. When I choose the rule, I see additional detail about the noncompliant resources (see the following screenshot). This allows me to view the Config timeline to determine when the resources became noncompliant, identify the resources’ owners, (if resources are following tagging best practices), and initiate a remediation effort. Having created the custom rule, I now create a Lambda function to poll Config periodically to detect noncompliant resources. My Lambda function will run daily to assess for noncompliance with my custom rule. When noncompliant resources are detected, I send a notification by publishing a message to SNS. Before creating the Lambda function, I create an SNS topic and subscribe to the topic for the email addresses that I want to receive noncompliance notifications. My SNS topic is called config-rules-compliance. Note: The Lambda function will require permission to query Config and publish a message to SNS. For the purpose of this blog post, I created the following policy that allows publishing of messages to my SNS topic (config-rules-compliance), and I attached it to the vpcflowlogs-role role that my custom Config rule uses. To create the Lambda function that performs the periodic compliance assessment, I go to the Lambda console, choose Create a Lambda Function and then choose Blank Function. 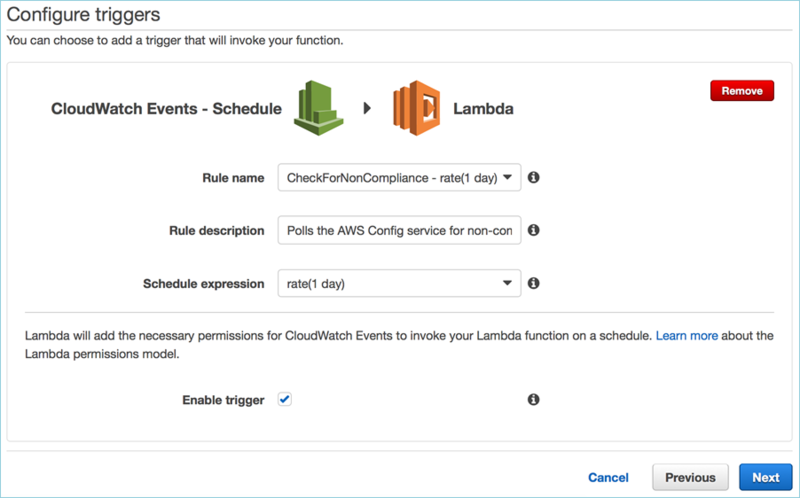 When configuring the Lambda trigger, I select CloudWatch Events – Schedule that allows the function to be executed periodically on a schedule I define. I then select rate(1 day) to get daily compliance assessments. For more information about scheduling events with Amazon CloudWatch, see Schedule Expressions for Rules. My Lambda function (see the following code) uses the vpcflowlogs-role IAM role that allows publishing of messages to my SNS topic. My Lambda function performs two key activities. First, it queries the Config API to determine which resources are noncompliant with my custom rule. This is done by executing the get_compliance_details_by_config_rule API call. Second, my Lambda function publishes a message to my SNS topic to notify me that resources are noncompliant, if they failed my custom rule evaluation. This is done using the SNS publish API call. This function provides an example of how to integrate Config and the results of the Config rules compliance evaluation into your operations and processes. You can extend this solution by integrating the results directly with your internal governance, risk, and compliance tools and IT service management frameworks. In this post, I showed how to create a custom AWS Config rule to detect for noncompliance with security and compliance policies. I also showed how you can create a Lambda function to detect for noncompliance daily by polling Config via API calls. Using custom rules allows you to codify your internal or external security and compliance requirements and have a more effective view of your organization’s risks at a given time. For more information about Config rules and examples of rules created for the CIS Benchmark, go to the aws-security-benchmark GitHub repository. If you have questions about the solution in this post, start a new thread on the AWS Config forum. Note: The content and opinions in this blog post are those of the author. This blog post is intended for informational purposes and not for the purpose of providing legal advice.